One of the most versatile keyboards currently manufactured, the Freestyle2 is an adjustable, separated keyboard offering considerable ergonomic benefits without sacrificing productivity. 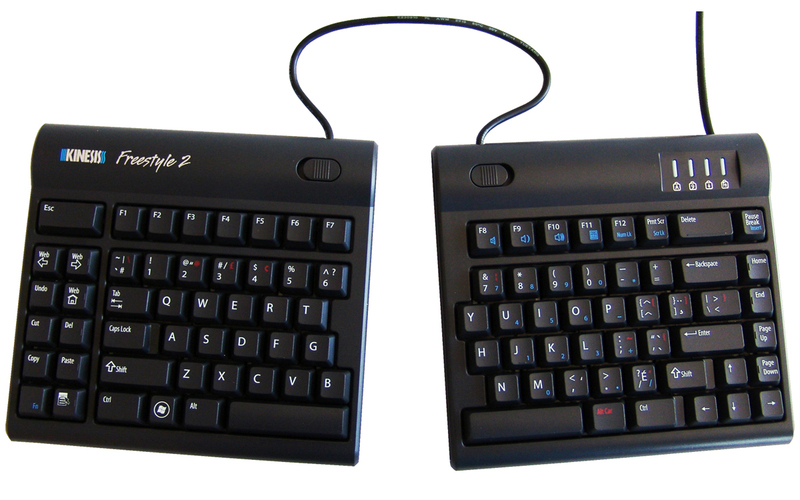 The Freestyle2 Keyboard is divided into two separate modules. The two sides are connected by a 9" cable by default, with a 20" cable also available. The separation allows users to position the left and right sides of the keyboard shoulder width apart, allowing the shoulders, elbows, arms and wrists to relax in an anatomically neutral position. This greatly improves posture and blood flow in the upper body, prevents undesirable rotation at the shoulders, and eliminates ulnar deviation at the wrist. 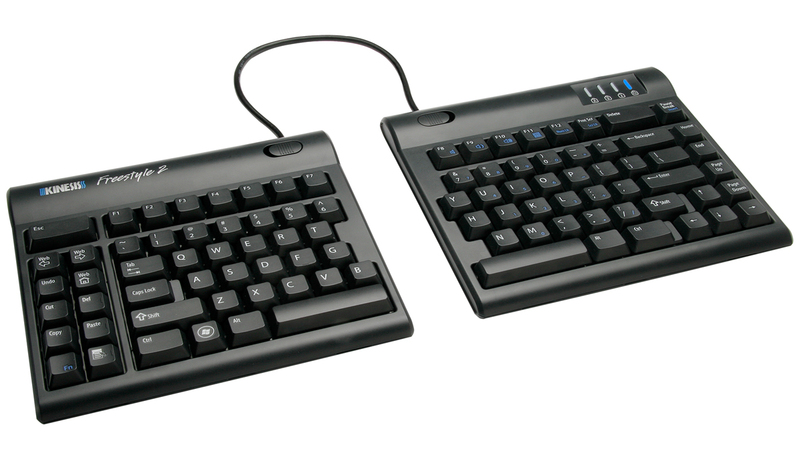 The Freestyle2 Keyboard features low-force, tactile membrane keyswitches. At only 45 grams, this is at least 25% less force than most traditional and even many ergonomic keyboards. Rated at 10 million actuations, the keyswitches on the Freestyle2 will provide years of quiet, comfortable typing. Both US English and French Canadian (dual-legended) models are available. The Freestyle2 Keyboard can be further customized with one or more of the Optional Accessory Kits described below (sold separately). With the addition of the appropriate Accessory Kit, this already highly configurable keyboard can be customized to provide even more ergonomic benefits. Palm Support Accessory Kit: Palm Supports can be attached to the keyboard to provide support and to prevent wrist extension. The Palm Support Accessory includes Lycra-padded Palm Pads that provide a soft surface for the Palm Supports and help to prevent pinch points on the underside of the palms. Note: Palm Supports will not fit on the V3 Accessory. Palm Supports will fit on the keyboard itself, or on the VIP3 accessory, below. VIP3 Accessory Kit: The popular VIP3 Accessory allows the keyboard to be tented at 5°, 10°, and 15° to help reduce pronation. The VIP3 Accessory includes Palm Supports that move as the keyboard tents, helping to reduce wrist extension. Ascent Accessory Kit: The more specialized Ascent Accessory independently tents the left and right modules of the keyboard in 10° increments, from 20° to a full 90°. The Ascent Accessory can be used with the Palm Supports at angles up to 40°. The 20" linking cable is generally advised when using the Ascent Accessory, as the longer cable allows greater flexibility. A linking plate, included with the Ascent Accessory, can be attached if desired to increase the stability of the two modules. Palm Pads Accessory Kit: Includes one pair of replacement Palm Pads for the Freestyle2 keyboard and its predecessor, the Freestyle Solo. 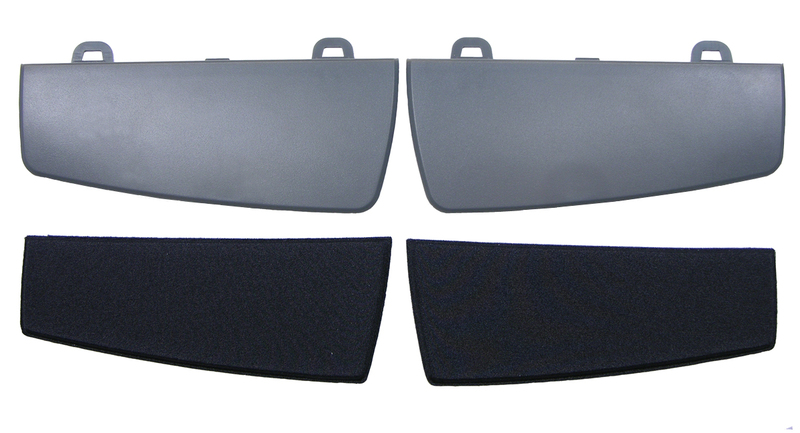 The Palm Pads are custom-fitted and designed to be affixed to the Palm Support Accessory. The pads are approximately 0.25" thick and made of closed cell foam with a gel-like feel covered with a smooth Lycra fabric. 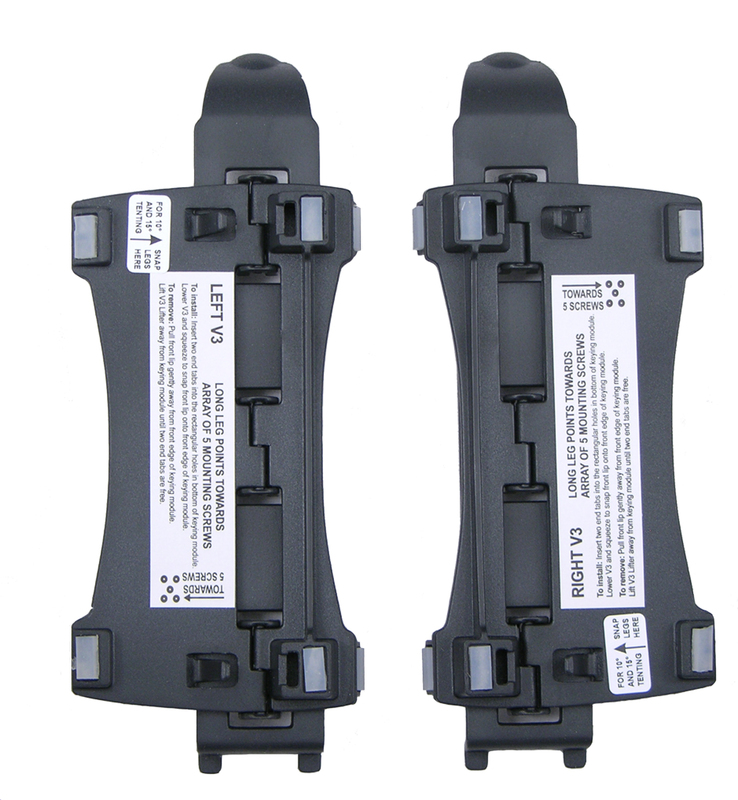 The pads can be removed easily when they need to be replaced. 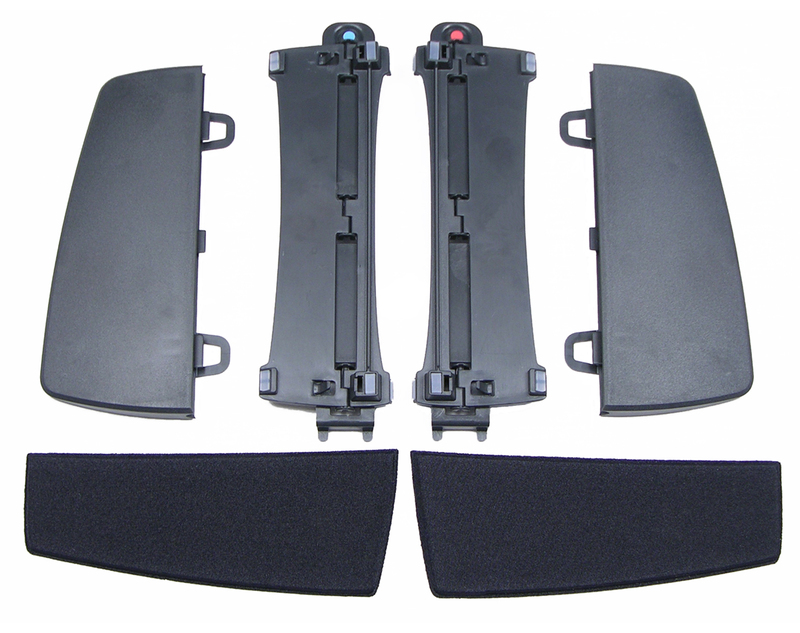 One pair of Palm Pads is included with the purchase of either the Palm Support Accessory Kit or the VIP3 Accessory Kit. 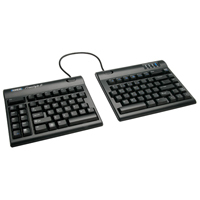 Easily Accommodates Individual Needs and Body Types - The Freestyle2 Keyboard can be configured to meet the unique needs and preferences of most individuals, whether tall or short, broad-shouldered or of slight build. Eliminates Overreaching for the Mouse - The Freestyle2 allows users to keep the mouse or other pointing device right beside the right or left edge of the keyboard. By keeping the mouse well within the comfort zone, users can reduce the potential for shoulder, neck and wrist pain arising from repeatedly reaching over the number pad for the mouse. 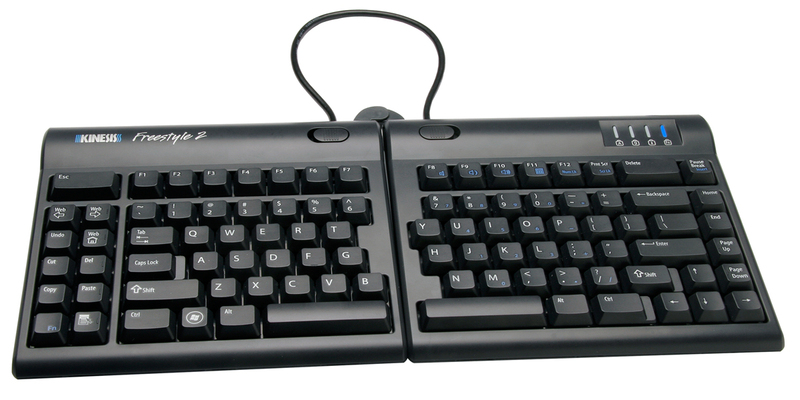 (A right-handed user with a conventional keyboard often must reach 12" for the mouse. The symmetrical, compact design of the Freestyle2 reduces this reach to under 6" for both left- and right-handed users.) Learn More About Overreaching. 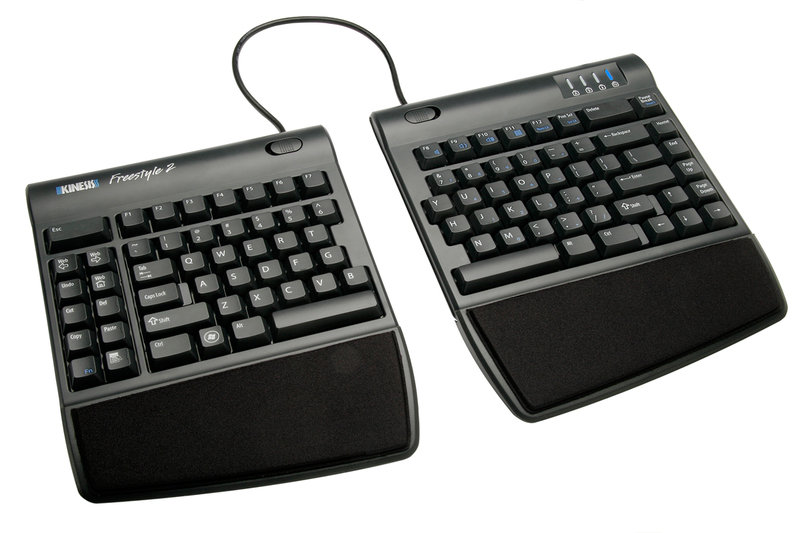 Reduces Wrist Extension - Most standard, and even many ergonomic, keyboards are positively inclined (i.e. the number row is higher than the space bar). A positive incline forces the user to lift the hands by bending up at the wrists. Maintaining the hands in this position strains the wrists and the muscles along the top of the hands and the forearms. The Freestyle2, even without added accessories, has a neutral, low-profile design (7/8") with 0° slope. The keycaps are negatively inclined at 10°. The result is an overall negative slope that helps to reduce wrist (and finger) extension when using this keyboard. Learn More About Wrist Extension. Reduces Finger Strain and Fatigue - Tactile low-force membrane keyswitches reduce the amount of effort required to type, benefiting all users from casual to the most intensive typists. Can Eliminate Wrist Extension - With the addition of the Palm Support Accessory, the potential for wrist extension is effectively eliminated, whether the keyboard is used flat or tented. Learn More About Correct Usage of Palm Supports. Can Decrease Forearm and Wrist Pronation - With a tenting accessory attached (either the V3 Accessory or the VIP3 Accessory), the Freestyle2 Keyboard gives users the option of typing with the palms slightly facing each other, rather than in the traditional "palms down" position that can often lead to fatigue or pain in the hands, wrists, elbows and arms. Both tenting accessories raise the inside edge of each keyboard module, offering tented angles of 5°, 10° and 15°. The V3 allows tenting alone; the VIP3 allows tenting with integrated palm supports. Learn More About Pronation. Can Support Vertical Typing Positions - With the addition of the Ascent Accessory, the Freestyle2 provides an option for those whose forearm pain is unusually severe, or whose arm may be immobilized due to injury. 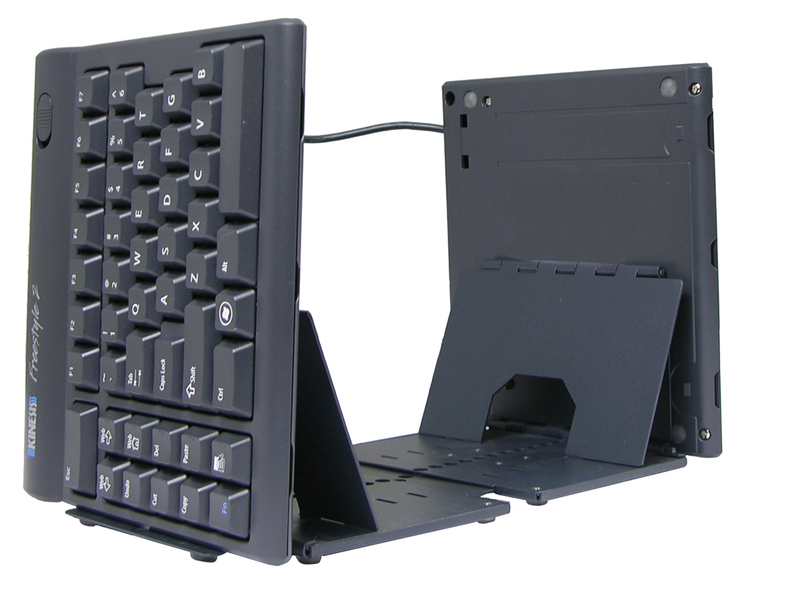 The Ascent Accessory allows the keyboard to be tented in 10° increments from 20° all the way to a fully vertical 90°. (Note: for the majority of users there is little ergonomic benefit to typing in a fully vertical position. Users who choose this option must be touch typists (as they will be unable to see the keys), and they must have arm support while typing to avoid straining the muscles of the shoulders and upper back.) Learn More About Pronation. Variable Separation: The two halves of the Freestyle2 can be separated up to 9" apart, a range which is sufficient for the majority of users. A 20" separation is available for users with broader shoulders, or for use with the Ascent Accessory. Quiet, Tactile Key Switches: The Freestyle2 features quiet, low-force, tactile membrane keyswitches. Rated at 10 million actuations the keyswitches on the Freestyle2 require only 45 grams of force. Familiar Key Layout: Standard key layout means minimal adaptation time for experienced typists. Sleek, Ultra-Low Profile Design: The Freestyle2 has a substantially thinner and narrower design than most ergonomic keyboards, with a height of only 7/8" and a width of 15.375". Browser, Editing, and Multimedia Hot Keys: Easily accessible, driverless hot keys offer users the option of decreasing the number of mouse clicks and increasing productivity. These hot keys include volume control and mute keys, a calculator key, multimedia keys, commonly used browser functions such as forward, back and home, and application functions such as cut, copy and paste. Hot keys on the inside columns have vertical raised ridges to provide tactile feedback and help the user remain oriented on the keyboard. 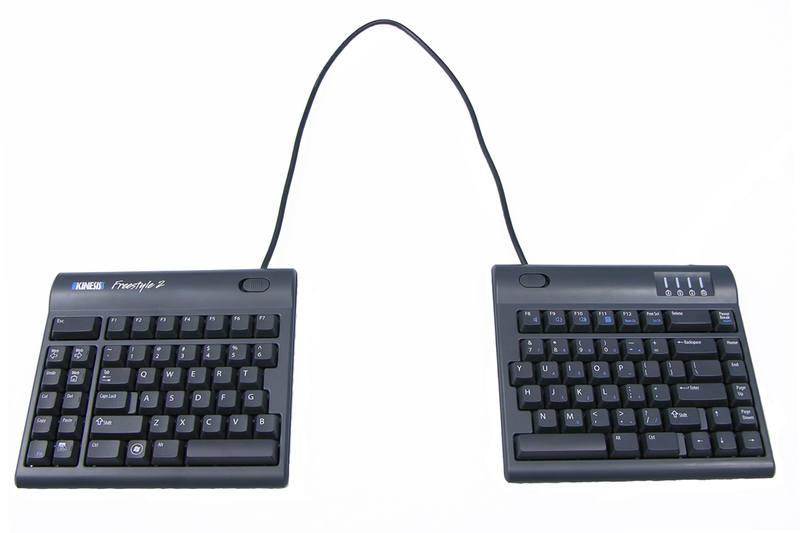 English or French Canadian Layout: The Freestyle2 Keyboard is available in either US English or French Canadian (bilingual) layout. Animated Demonstration: This short animation shows how the Freestyle2 Keyboard and Accessory Kits work together. 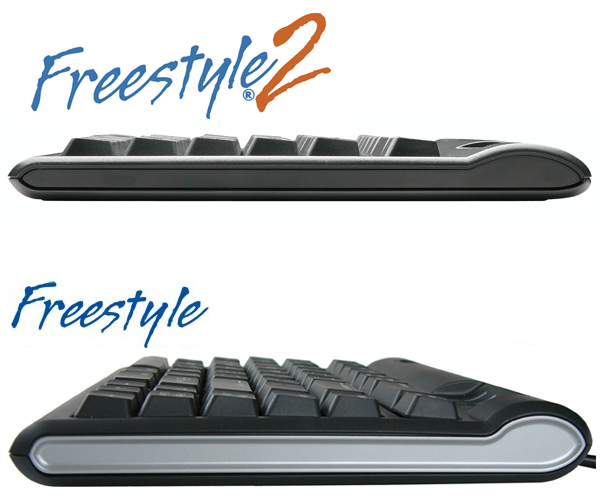 Product Comparison: Review the differences between the Freestyle2 Keyboard and its predecessor, the Freestyle Solo. Atlas Ergonomics White Paper: Published in March 2010 by Atlas Ergonomics of Grand Haven, MI., this white paper reports on that company's intensive five-month study of a split keyboard design. The Freestyle Solo (the predecessor to the Freestyle2) plus the compatible VIP Accessory, was chosen for the project. Researchers studied the impact of the Freestyle Keyboard’s split design on the posture, discomfort, and performance of approximately 80 software manufacturing employees, focusing in particular on the positions of the hands and upper extremities during keyboard use. The study found that 92% of participants used the Freestyle in its split configuration, rather than splayed (i.e. with the two modules connected at the pivot point). The degree of ulnar deviation was reduced across all BMI levels and body types with no reduction in performance for the duration of the study. At the end of the study 96% of participants said they preferred the Freestyle over their previous keyboard. "An Evaluation of a Totally Split Compact Keyboard and its Impact on Posture, Discomfort, and Performance" by Atlas Ergonomics, is 21 pages long and available in .pdf format. Become familiar with the embedded numeric keypad. The embedded keypad gives you two additional layers, one for numbers, and one for navigation. These layers are accessed via the same keys on the right hand module of the keyboard. Learn More About Operating the Embedded Numeric Keypad. Purchase the Palm Support Accessory if you would like Palm Supports, but don't need to tent the keyboard. Purchase the V3 Accessory if you need to tent the keyboard, but don't want palm supports. The V3 Accessory can tent the Freestyle2 to 5°, 10° or 15°. Note that the V3 Accessory cannot be used in conjunction with the Palm Supports. Common situations where this accessory is recommended include using the Freestyle2 on a keyboard tray, or with an inline pointing device that has non-removable Palm Supports. Purchase the versatile VIP3 Accessory if you need to tent the keyboard, and also want palm supports. The VIP3 Accessory tents the keyboard modules by 5°, 10° or 15° and comes with removeable Palm Supports included. Purchase the Ascent Accessory only if you must type with your hands in a more than 15° vertical orientation. (Note that you must be a skilled touch typist to use this more extreme solution effectively.) The Ascent Accessory can be used with Palm Supports (sold separately) at angles up to 40°. The 20" separation cable is typically recommended for this accessory, as it provides the needed flexibility. 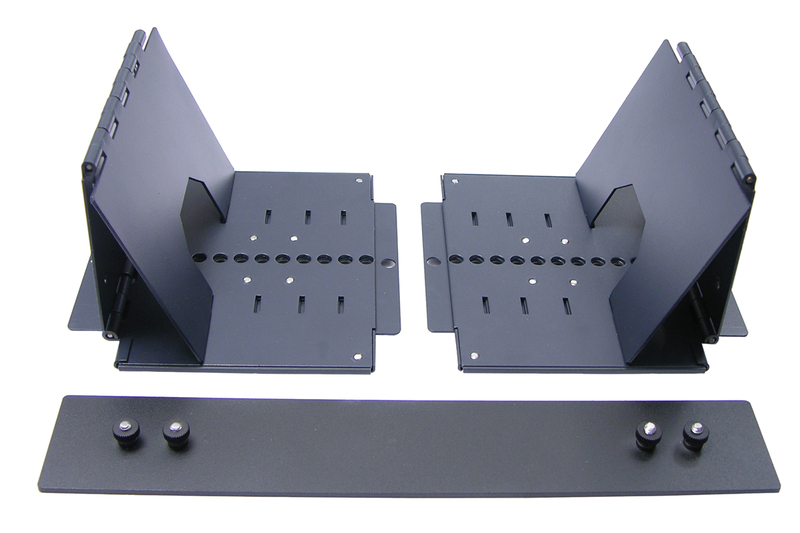 An optional linking plate (included with this accessory) may be used to connect the two tenting modules if desired for increased stability. Purchase a separate numeric keypad if you key in a lot of numeric data. See the Numeric Keypads category.